Chaosium just won’t stop with the awesome. 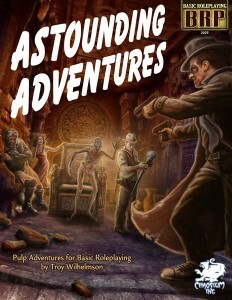 They’ve now officially announced Astounding Adventures!, a 30s/40s pulp supplement for BRP. Dayum! My favorite game of all time was Justice, Inc. the standalone, pre-unified Hero System box set for the pulp genre. Easily my most successful and longest-running campaign (as a GM) was a Justice, Inc. game featuring a couple of recurring characters and a rotating cast of extras. It was the right level of pulpy goodness without being too derivative of the classics of the genre. Unfortunately, Hero has long since become too complicated for my lifestyle and gaming tastes. But BRP, as I’ve mentioned more than once, hits the sweet spot between fast & dirty enough for me as a GM and crunchy and complex enough for the folks I game with most regularly. So maybe it’s time to dust off my notes. I’m not seeing a projected release date other than “2012” so I’m not going to start getting too worked up just yet. But I’m pretty confident I’ll be dropping my cash on this once it’s out. And hey, if nothing else, that’s a pretty sweet cover they’ve put together for this thing. This entry was posted in Basic RolePlaying on May 7, 2012 by the venomous pao. Way back in the day, I GM’ed a low-power superhero type campaign that was essentially modern pulp, using BRP rules. That was before the Big Gold Book suggested things like Total Hit Points, Dodging Missile Weapons, Fate Points, et. al. I think those rules options really capture the genre. Not Hit Points by Location, though. I can’t think of a bigger pulp-style buzzkill than that. I imagine that must have been quite the awesome game, G-Man. 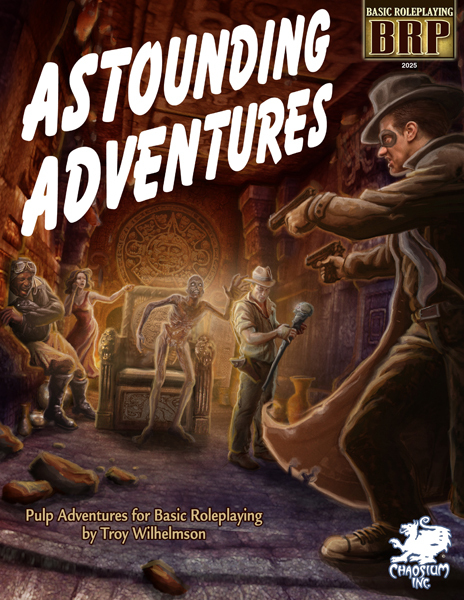 There’s no doubt in my mind that BRP can do pulp-style games with ease and panache. HP by location is, to me, the death of fun for all genres. It’s why I’ve always preferred the Elric! approach (which, as we both know, is the default style in the BGB, thankfully!). I never minded hit locations in games like Hero where you weren’t actually tracking each hit individually, but the idea of assigning damage to, say, the left thigh, just drags me down. We’re really living interesting times for the hobby. I haven’t had so many games and supplements on my “must buy” list since the 90s. I’m in 100% agreement, Gianni. And I’m especially happy that things are going so very gangbusters for BRP in particular. ‘Tis a good time to be a percentile geek! Glad to hear I’m helping spread the word! Yeah, it’s a bummer about Pulp Cthulhu and all of its trials and tribulations. I do like your idea of just adding a chapter to AA! and being done with it. Maybe they’ll go that route? Somehow I doubt it, but it would be nice. Looks fantastic. We’ve definitely entered a new golden age for pen and paper RPGs. Oh, and welcome to Strange Stones, JRDS. Thanks! I never could have predicted the trend either, but I’m sure pleased it’s here.